I would like to wish our Christian readers across the world a Happy Easter and I also would like to wish a happy Holi to our colleagues in India and Nepal and other parts of the world that celebrate this holiday. It is is a religious spring festival celebrated by Hindus as a festival of colours. The staff of PreemploymentDircetory.com and The Background Buzz wishes to express our heartfelt appreciation and thanks to the readers, advertisers and clients for contributing to our success over the last seven years. It is only because of your support that we have achieved the publication of our 100th edition and we profusely thank you. Welcome to our New Platinum Members: Sentinel Screening, ClearStar.net, Firstpoint and United Background Screening. 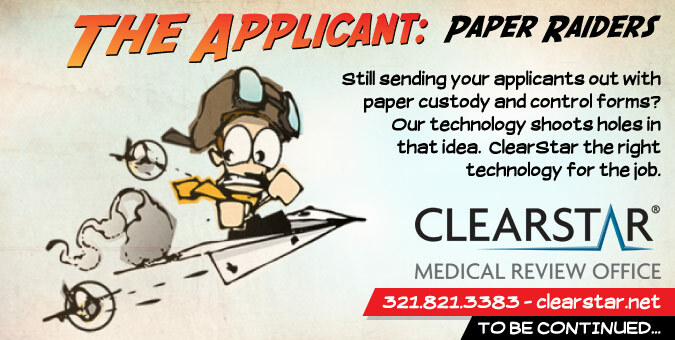 Be sure to check out ClearStar.nets new adventure ad. 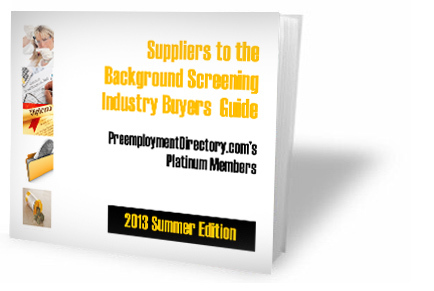 We are starting to work on our Summer Edition of the Suppliers to the Background Screening Industry Buyers Guide. We have enclosed information about the Buyers Guide for your information. 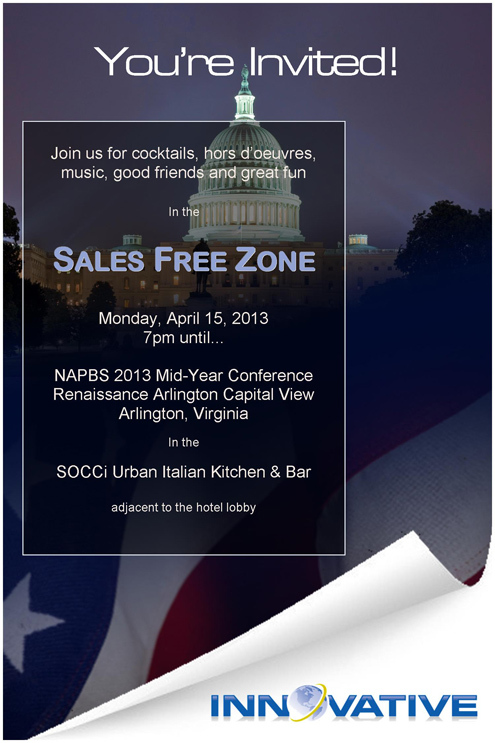 Be sure to visit our exhibit booth at the NAPBS Legislative Conference and learn about a special we will be offering at the Show. A new web site for PreemploymentDirectory.com is coming soon (I hope soon means May). Our goal is to become the major portal to the background screening industry and to broaden the opportunities to connect employers and background screening firms. One new feature will be the capability to host your white papers, videos, etc. with links to your web site to support your on-going SEO efforts and leads generation. Please note that all content in The Background Buzz is copyrighted. No summaries of articles or articles may be reprinted or distributed in internal or external newsletters without written permission from the Publisher. Thanks for joining us this month and as usual stay safe until next time. P.S. Ni sa yadra (ni sah yan dra) is good morning in the Melanesian language which is spoken by about 85% of the population of Fiji. The most important Melanesian language is Fijian, spoken by about 334,000 persons and widely used in Fiji in newspapers, in broadcasting, and in government publications. Organizations need to recognize the advantages and disadvantages of behavioral risk of all employees. Doing so allows an organization to manage risk in a constructive way, according to a study published by SHL, an Atlanta-based talent management company. The study claims 1 in 8 managers and professionals globally represent a high risk to their companies. The risk comes from lower-quality decision-making and poorer communication. Moving up the corporate ladder shows a decrease in risk level: 1 in 15 executives pose a high risk for their companies. Conversely, 1 in 7 lower-level employees, such as team leaders and individual contributors, provide the highest potential for risky behavior. Finally, 1 in 8 frontline staff represent a high risk to their companies because of counterproductive behaviors, such as lower compliance and attention to detail, less of a commitment to a company and reluctance to working with a team. These counterproductive behaviors can lead to more errors in the workplace or damage a brand's name through poor customer service. SHL recommends businesses commit to enforcing ethical standards and developing effective channels for employees to comfortably communicate ethical infractions to their superiors. In a move that is raising concern about limiting access to public documents, California courts could charge $10 for each record search under a proposal included in Gov. Jerry Brown's budget. The governor included the search fee as one of the ways the courts can raise $30 million a year to offset budget cuts. The judicial budget has been reduced by more than $1 billion through cuts and transfers over the past five fiscal years, which has resulted in fewer courtrooms, construction delays and an array of higher fees. Media organizations and good-government advocates worry that such a fee would restrict access to files the public has a right to view. Democratic lawmakers also expressed distaste for restricting information to those who can afford it. Currently, there is no charge to search a court file, although courts charge $15 to look up cases that require a court employee to take more than 10 minutes to search. Under the governor's proposal, a person could search for free for a case in which that person is a party but would be charged $10 for each additional search. Lawmakers are holding off on the proposal until the governor updates his budget in May. A bill, Senate Bill 5568, the Fair Tenant Screening Act Part 2, to ensure victims of domestic violence have fair and equal access to housing passed the Senate on Monday night. "Being a victim of domestic violence is a trauma I couldn't imagine. There's no reason why someone should have to have that horrible incident brought up again while looking for a home. This bill prevents that from happening." New York state officials reported that the DMV's use of facial recognition software for driver's licenses since 2010 has resulted in more than 2,500 arrests of those trying to steal someone else's identity or trying to get a second license. "Through this program, we are successfully taking dangerous drivers off our roads, helping to track down criminals, and protecting taxpayer dollars - sending a clear message that New York State does not tolerate identity fraud and those who try will be caught," Gov. Andrew Cuomo said in a statement. The DMV started using its facial recognition software to help identify persons who may have had their license suspended, but are trying to get another license, or who are trying to steal another person's identity. The system uses software algorithms to compare new photos taken at the DMV with existing photos in the agency's database. If there's an inexplicable match, then an investigation by "trained staff" ensues. The sci-fi-like enhancement to the licensing process is not hailed by all. Watchdogs fear the license photo database being shared with law enforcement and other agencies. Felony arrests that resulted from facial recognition included more than 100 people who had "active felony warrants" under one driver's license name, but set up a new state ID under an alternate name. The social media privacy debate continues to rage - and now Congress has taken up the reins. Rep. Elliot Engel, D-N.Y., has introduced H.R. 537, the "Social Networking Online Protection Act." Engel's bill would make it illegal for employers to ask job applicants and employees for passwords to access their social networking sites and email accounts. If passed, it will address the concerns of 21 states that have similar legislation pending, and provide a national legal standard that has already been adopted in California, Delaware, Illinois, Maryland, Michigan, and New Jersey. While a national standard on this issue would be a positive step toward protecting individual privacy, it will not change an employer's ability to see what is shared publicly. Employers who still want to use social media as a background screening tool shouldn't ask for passwords and shouldn't believe everything they see online. They should, however, make sure to put a well-trained individual who is knowledgeable about potential legal claims in charge of reviewing and vetting the information and consider FCRA implications. Federal Trade Commissioner Edith Ramirez, recently designated by the Obama administration as the next chair of the Federal Trade Commission, is expected to champion globalized approaches to consumer privacy protection and to clamp down on fraudulent marketing aimed at Spanish-speaking communities. The fact that the Obama administration chose a woman comes as no surprise, considering criticism of the president's male-centric senior advisory staff. Ramirez has a background steeped in antitrust and competition issues, and served as director of Latino outreach for the Obama 2008 campaign. Jeffrey Chester of the Center for Digital Democracy said, "Under (Ramirez's) leadership, we expect the FTC to blaze a new ground on privacy." Ramirez has expressed interest in leadership on APEC's cross-border privacy rules and the intersection between privacy and technology. She has also indicated support of robust rules around children's data collection and raising the profile of the agency's work on behalf of all minority and underserved communities. The Federal Trade Commission (FTC) is employing its authority to regulate deceptive and unfair practices to go after companies that impinge on consumer privacy. The agency is also finding new ways to apply old laws to current practices. As the amount of online data about consumers multiplies, so does the number and sophistication of attackers trying to get it. And the issue becomes critical as the attacks target corporate intellectual property and the nation's infrastructure. "Paying attention to cybersecurity is a business imperative," said Christopher Wolf, a Hogan Lovells partner. "There are repeated attacks on infrastructure, and businesses need to protect their trade secrets and preserve the ability to operate their business. There are also privacy issues if personal data is affected. I expect to see more attention by Congress and the SEC [Securities and Exchange Commission] to corporate disclosures on cybersecurity." Although there is a lot of interest in consumer privacy on Capitol Hill, rifts between and within the parties stand in the way of Congressional action. Drug Testing Cheating Law - A person is guilty of a misdemeanor if he or she knowingly or purposefully manufactures, delivers, owns, uses, or possesses a substance or device designed to falsify a drug test (Ch. 481, Sub. 1, Part 133). Workers' Comp Denial Law - An insurance carrier is not required to provide compensation for an injury that occurred while the employee was in a state of intoxication (§406.032). §406.013 provides a definition of intoxication and explains that a positive result from a blood test or urinalysis creates a rebuttable presumption that a person is intoxicated and does not have the normal use of mental or physical faculties. This does not necessarily mean employers are required to use a blood or urine test when contesting workers' comp claims. Unemployment Comp Denial Law - A TWC precedent case (No. 97-003744-10-040997) sets out clear guidelines for employers responding to an employee's unemployment compensation claim. To establish that a claimant's positive drug test result constitutes misconduct, an employer must provide five things: a policy prohibiting a positive drug test result, evidence that the claimant has consented to be tested under the policy, documentation to prove chain of custody of claimant's sample was maintained, documentation to establish GC/MS confirmation was performed after the initial test, and documentation of test results in relation to a stated test threshold. A district court has ruled that random tests for alcohol performed on probationary employees who work in safety-sensitive positions do not violate the Americans with Disabilities Act (ADA). The decision in EEOC v. United States Steel Corp., marks the first time that any court has addressed this issue and could serve as a reference point for employers accused of discrimination through their use of medical examinations. The court agreed with U.S. Steel's argument that the random testing program is job related and consistent with business necessity because it allows the company to detect alcohol impairment on the job, which is a workplace hazard. "Employers can view the U.S. Steel decision as a very important affirmation of their right to take reasonable steps to ensure a safe workplace," said Robin Shea, a partner at employment law firm Constangy, Brooks & Smith. While the court's decision should provide a measure of relief to employers in heavy industry, Shea advises that until the case is resolved on appeal, employers should continue complying with the EEOC's guidance. Vermont has become the latest state to see a marijuana legalization bill filed this year. House Bill 499, "An Act Relating to Regulation and Taxation of Marijuana," was introduced to the House and assigned to the House Judiciary Committee on Tuesday. It would allow people 21 and over to possess up to two ounces of marijuana and grow up to three plants. The bill also legalizes the possession of pot paraphernalia. It would also "create a regulatory structure for the wholesale and retail sale of marijuana that includes licensing and oversight by the Department of Liquor Control." People who possess more than two ounces or three plants or who sell marijuana outside regulated commercial channels would still be subject to criminal penalties. (a) Filter the data so as to only provide conviction information. (b) Not filter the data because it is information coming directly from the state. (c) Filter the data to comply with FCRA section 605 and state law. (d). Not filter the data because the CRA is only a conduit of information. On February 7, 2013, "The Opportunity to Compete Act" was introduced in the New Jersey Senate, seeking to dramatically curtail the ability of New Jersey employers to obtain or use a job applicant's criminal history during the hiring process. The proposed bill would require employers to engage in a multi-step process before rejecting an applicant based on a criminal record. Unfortunately, the process proposed in the Act lacks clarity as currently drafted. Under the Act, most employers would be prohibited from inquiring about an applicant's criminal history during the application process, either directly or via a background check, until after a conditional job offer is made. Once a conditional job offer is made, an employer would be permitted to inquire about the applicant's criminal history only after providing a detailed notification form, obtaining written consent from the applicant, and then providing the applicant with a standardized Notice of Rights form. Employers would then be permitted to consider only those specific types of convictions or pending charges expressly identified within the Act, and would be precluded from considering non-pending arrests, or erased, expunged, pardoned, or juvenile convictions. Employers who violate the bill may be subject to civil penalties. The U.S. Department of Labor's Office of Federal Contract Compliance Programs (OFCCP) has posted a Directive on "Complying with Nondiscrimination Provisions: Criminal Record Restrictions and Discrimination Based on Race and National Origin." The Directive incorporates guidance issued on the same subject by the EEOC. The OFCCP Directive and the EEOC Enforcement Guidance emphasize the racial and ethnic disparities reflected in incarceration rates and advise contractors to proceed with caution when relying on job applicants' criminal records for employment decisions. The OFCCP warns that policies and procedures that categorically exclude individuals based on criminal records and do not take into account the nature and age of an offense may violate federal antidiscrimination laws such as Title VII. The agency clarifies that this is because an automatic bar to hiring those with a criminal record will likely result in an adverse impact on certain racial or ethnic groups. If an employer's exclusion policy creates adverse impact on a protected class, it will need to prove that it is job-related and consistent with business necessity. The controversy over employers requesting or requiring employees or applicants to disclose their usernames or passwords for their online accounts at services like Facebook and Twitter, has led some states to pass laws restricting employers' rights to make such requests. On March 7, 2013, the Utah State Legislature joined these states and passed the Internet Employment Privacy Act (the Act). Under the Act, Utah employers may not request that an employee or job applicant disclose a username and password allowing access to a personal Internet account. It also prohibits employers from taking an adverse employment action (like refusing to hire, demoting or firing) against an employee who fails or refuses to disclose a username or password for a personal Internet account. A "personal internet account" is defined under the Act as an online account used by the employee or applicant for purely personal reasons unrelated to work. The Act provides a private right of action for any person aggrieved by such an action, but limits any potential award to $500. Even with this limited exposure, the Utah Internet Employment Privacy Act requires that employers proceed with caution when accessing or requesting access to employee information on the Internet. Democratic Representative Steve Cohen from Tennessee, has introduced H.R. 645 in the House of Representatives. The legislation would amend the Fair Credit Reporting Act (FCRA) to prohibit employers from using credit reports in the hiring process as well as prohibit the use of credit reports for the purpose of making adverse employment decisions. The only exceptions to this would be for jobs which require a security clearance, are with state or local government, or for certain individuals working in the financial industry (i.e., supervisory, managerial, professional, or executive positions). If this legislation passes, it means employers would not be able to consider one's credit history as part of a background check by a background screening company for lawyers, cashiers, pharmacists, NBA referees, executives in non-financial institutions, jewelers, academic financial aid offices, Human Resources employees, procurement employees and so on. Montserrat C. Miller, NAPBS Washington counsel suggest that you check out the bill and see if your representative is a co-sponsor of the bill as so far the legislation has 29 co-sponsors. The bill, the Equal Employment for All Act is pending in the House Financial Services Committee. You can contact your member of Congress to share your concerns about the legislation by calling the Capitol Hill switchboard at 202-224-3121 and asking to be directed to your members office. Oklahoma schools could increase school safety and security by expanding the use of fingerprint background checks of adults who regularly interact with students, according to one state lawmaker. House Bill 2228, by state Rep. Joe Dorman, would allow schools to authorize fingerprint background checks on anyone interacting with students in school-sponsored activities, including volunteers. Currently, schools cannot conduct these checks unless specifically authorized by state law. The legislation was approved by the House Public Safety Committee and now advances to the House Calendar Committee. The Connecticut General Assembly's Labor and Public Employees Committee is drafting Bill No. 159, titled "An Act Concerning Employee Privacy," which would "prevent current or potential employers from requesting or requiring that employees or potential employees provide passwords to their personal accounts as a condition of their employment." Accurate Background, a technology leader in the background screening industry, has announced a bilingual, online candidate entry technology to support global clients with the need to collect information from job applicants in other languages to conduct background checks. Following consecutive years of extensive global growth, Accurate Background continues to expand their services worldwide to improve the job candidate experience while supporting diverse language and compliance requirements in each country. Accurate Background's French Canadian offering on their Global Portal is part of an ongoing international translation project which leverages rule-based protocols to intelligently look at a job candidate's address and automatically identify potential language options for translation. Job candidates can then select the language of their choice directly through the intuitive, web-based technology to translate the online application including data entry fields, compliance forms, and email communication used during the background screening process. deverus, Inc., the leading provider of mission-critical workflow solutions to the background check industry, announced that it is the first independent technology vendor to the industry to join the Oracle Partner Network (OPN). The new partnership will allow deverus to integrate its online solutions with Oracle-based customer applications more quickly and more reliably than ever before. "We are pleased to take this important step with Oracle," said Shane Long, CEO of deverus. "Our Hubworks integration engine already cuts substantial time and cost from the integration process, but our new partnership with Oracle will allow us to improve even further; first, by working with Oracle to identify customer-specific integration issues well in advance; second, by improving the time-to-completion of our integration projects; and third, by improving the quality of the integrations that we deliver to our customers. Oracle-based employers and background check companies can have full confidence that Oracle will be an active and involved partner when they decide to integrate their systems with deverus." As a new OPN member, deverus now enjoys a broad range of benefits unavailable to other independent technology vendors to the background check industry. These benefits include enhanced access to Oracle support documentation, technical personnel, and account managers, allowing Deverus to invoke Oracle's customer knowledge and domain expertise with greater ease at any point in the integration process. HireRight , a leader in on-demand employment background checks, drug and health screening and electronic Form I-9 and E-Verify solutions, announced it has added nine new products available in up to 181 countries to its global screening services portfolio. HireRight continues to expand its global platform by introducing new country services that reinforce its global reach and local touch. "With today's war for talent, employers need every competitive advantage to hire the best candidates, regardless of where they have lived or worked, and get them onboard quickly," said Mike Petrullo, president and CEO for HireRight. "Continuing to invest in and expand upon our market-leading international screening capabilities lets our customers broaden their talent search globally, while still making informed hiring decisions with an international talent pool." First Advantage and Findly announced they have completed a transaction to create a separate new entity that brings together the First Advantage ATS, Assessment and Recruiting Solutions businesses with Findly under the Findly brand. The talent marketplace is being buffeted by major changes brought about by disruptive mobile, social and data offerings. Findly is at the nexus of these changes, and together with the scale provided by the First Advantage businesses, Findly will drive market-leading innovation that benefits you and the entire market. InfoMart has successfully proven compliance with the background screening industry's strictest professional standards achieving accreditation with the National Association of Professional Background Screeners (NAPBS). For more information about InfoMart, please visit www.infomart-usa.com or call (770) 984-2727. As remote hires continue to increase, companies are faced with finding a way to comply with Form I-9 rules – completing within the one-day/three-day rule, and ensuring a company representative views original documents, with the employee present. The number of employees who telecommute continues to increase, according to TeleworkResearchNetwork.com. As companies hire talent from across the country, they are finding a new compliance challenge cropping up – ensuring the Form I-9 is completed within the one-day/three-day rule. New York has become the latest state to see medical marijuana legislation introduced this year. On Tuesday, Assemblyman Richard Gottfried filed Assembly Bill 6357 and Senator Diane Savino filed companion legislation, Senate Bill 4406. The bills would create a tightly regulated system of medical marijuana supply, complete with patient registries, but would not allow patients or designated caregivers to grow their own medicine. Patients would be limited to possessing no more than 2.5 ounces. Drug reform and marijuana advocacy groups welcomed the introduction of the bills, but some expressed concerns that the measures as written do not provide enough protection for patients. "Patients and their families in New York have suffered far too long because New York continues its retrograde approach to marijuana policies, even as other states move forward with more sensible approaches," said Julie Netherland, deputy director of New York policy for the Drug Policy Alliance. Drug Testing Index (DTI) data released by Quest Diagnostics, provider of diagnostic information services, reveal a jump in positivity rates for marijuana in oral fluid vs. urine in the U.S. general workforce. While marijuana positivity rates in oral fluid and urine changed little between 2008 and 2011, the gap between oral fluid and urine positivity rates for marijuana increased during this time from a 29% higher positivity rate in oral fluid in 2008 to a 42% higher positivity rate in 2011. Due in part to advances in oral fluid testing technology implemented in late 2011, the oral fluid marijuana positivity rate was 70% higher than that of urine (3.4% vs. 2.0%) in the first half of 2012 as compared with 2011. The Maryland House of Delegates Monday approved House Bill 1101 that would allow academic medical centers to provide medical marijuana to patients whose doctors recommend it. The bill would set up a medical marijuana commission to which the centers could apply for permission to administer marijuana to patients within a research-focused program. Marijuana would be grown either by state-licensed growers or by the federal government. Sponsored by Del. Dan Morhaim (D-Baltimore), the bill would require the academic medical centers to specify qualifying medical conditions for treatment; treatment duration and dosage; where marijuana would be obtained; sources of funding; and a plan for monitoring data and outcomes, among other things. Seasonally adjusted employment data released by the U.S. Bureau of Labor Statistics indicates that overall U.S. nonfarm payroll employment increased by 236,000 jobs in February. The job gains far exceeded many economists’ predictions that put payroll additions for February at around 175,000 new jobs. The jobs report was much stronger than expected and unemployment has reached a four-year low. Employment growth was mostly driven by new job creation in professional and business services (+73,000), construction (+48,000), health care (+32,000), retail trade (+24,000), and information (+20,000). Employment in other major industries showed little change over the month. The overall U.S. unemployment rate edged down from 7.9% in January to 7.7% in February. The AAMVA Code Dictionary (ACD) is a key component to driving records. The ACD Codes reflect provisions in federal regulations dealing with commercial drivers. The states use the codes to identify the type or reason for a conviction and the reason for a driver withdrawal such as a suspension, revocation or withdrawal when communicating with the Commercial Driver's License Information System (CDLIS) or with the Problem Driver Pointer Systems (PDPS). Many states have adopted these three-character codes in their own proprietary conviction code tables, especially when indicating out-of-state convictions. The American Association of Motor Vehicle Administrators ( AAMVA ) is the copyrighted owner of the ACD. AAMVA recently released a new version - ACD Release 5.0.0 - which is scheduled to take effect on September 1, 2013. There are additions, deletions, and revisions of codes. An overview of these changes appears at www.mvrdecoder.com . Click on the "About ACD Codes." Over the past several years, states' filing offices have been busy gaining legislative approval for implementing the amendments to Article 9 (Secured Transactions) of the Uniform Commercial Code. The changes are to go into affect July 1, 2013. Approx. 80% of the states have passed laws to date. On March 20, 2013, Montana's governor signed HB212 to enact the 2010 amendments to Article 9. Legislation in Mississippi (SB2609) and New Mexico (SB146) have also recently been passed and bills been sent to their governors for signature. The transition to the 2010 Amendments means many states will need to change their UCC Forms. An excellent array of sample new forms is provided by the Texas Secretary of State at www.sos.state.tx.us/ucc/new-forms-alert.shtml . One in four American adults has some type of criminal record (meaning an arrest or a conviction), according to the Justice Department and the National Employment Law Project . Assuming that the physical environment, data and network have been secured, the weakest link in most security plans is the people who are involved in the business processes. In our industry, we spend large amounts of time and money to verify that the reported data is for the correct applicant or consumer. How much effort is taken to ensure that only the right people can access this information? If there is a breakdown in validating the identity of the people who provide, review, deliver, or receive the information, then the rest of the security measures were wasted. For this reason, all system security begins with authentication, the process of determining whether the person is who they claim to be. The key to authentication is balancing the level of certainty that we need about the person's claimed identity with the level of inconvenience that they are willing to accept. In other words, the more onerous the requirements are to prove their identity, the harder the system will be for them to use it and the less likely they will be to continue using it. Multi-factor authentication (MFA) is an approach that depends on more than one factor to validate a user's claim of identity. MFA uses a combination of something a user knows, like a password or PIN, with something the user has, like a smart card or ATM card, and/or something the user is, like a fingerprint or biometric characteristic. By authenticating the username (claim to identity) with a strong password (something they know) and a rotating security code from a smart card (something they have), the system can recognize the user with a higher level of certainty than a username and password combination alone would provide. The more factors that are required, the greater the certainty will be while the usability of the system will decrease. The key is finding the sweet spot in each implementation that will ensure the user's identity while remaining easy to use. Kevin Coy is a Partner in the Washington DC office of Arnall Golden Gregory LLP. Kevin advises background screening companies and other clients on a wide range of privacy and consumer regulatory issues, including Fair Credit Reporting Act, Gramm Leach Bliley Act, Drivers' Privacy Protection Act, and Dodd Frank Act compliance issues, as well as data breach matters. Kevin also represents clients with matters before the Federal Trade Commission, the Consumer Financial Protection Bureau, and other consumer protection agencies. Kevin can be contacted at Kevin.Coy@agg.com or 202-677-4034. On Capitol Hill, the current debates over background screening primarily are focused on whether-and if so, to what extent-mandatory background checks for gun purchasers should be expanded. Competing bills have been introduced and congressional hearings have produced fireworks, although it is still unclear what legislation, if any, ultimately will pass. Employment background screening activity also is underway on the Hill, but not receiving the same level of congressional attention as the gun-control legislation. Rep. Steve Cohen (D-TN), for example, has reintroduced his bill to prohibit the use of credit checks for many employment purposes (H.R. 645 in the current Congress). The bill has two dozen co-sponsors, although no hearing on the bill has been scheduled and the bill is not expected to move through the Republican-controlled House. President Obama announced that he was elevating Commissioner Edith Ramirez to replace Jon Leibowitz as Federal Trade Commission (FTC) Chairman. It is believed she will have a keen interest on FTC enforcement in the privacy space as an FTC priority. Currently, the agencies believe that their Memorandum of Understanding is working well for now and they have not observed any inconsistencies arising from instances where companies have sought informal guidance from the agencies. 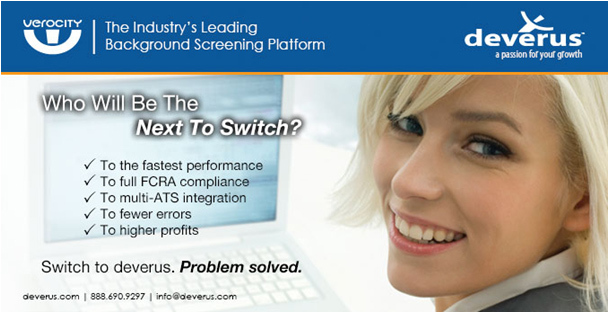 Suppliers to the Background Screening industry Guide Now Available! York University says it has discovered that a controversial executive it fired in 2010 over fraud allegations misrepresented his academic credentials when it hired him, the Toronto Star reported. The Canadian institution is in the midst of a lawsuit accusing the former official, Michael Markicevic, of leading a scheme involving two dozen other parties that featured scores of fraudulent home-improvement invoices. Mr. Markicevic has denied the lawsuit’s claims. And more, including how America measures up in the global competition for top talent, a history of legislation and glossary of key terms. The Justice Department announced that it reached an agreement with Centerplate Inc., resolving allegations that the company violated the anti-discrimination provision of the Immigration and Nationality Act (INA). Centerplate, based in Spartanburg, S.C., is one of the largest hospitality companies in the world. With over 10,000 employees nationwide, Centerplate provides food service to over 250 stadiums, convention centers and entertainment venues across the country. The Justice Department’s investigation concluded that, for at least the past three years, Centerplate engaged in a pattern or practice of treating work-eligible non-U.S. citizens differently from U.S. citizens during the INA’s employment eligibility verification processes, including E-Verify, by requiring specific documents issued by the Department of Homeland Security from non-U.S. citizens, while not making similar requests of U.S. citizens. Employer representatives have testified before a congressional panel that they support the expansion of the federal government's E-Verify electronic employment verification system, which experts agree will be a central piece of comprehensive immigration reform. 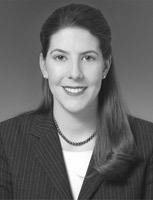 Emily Tulli, a policy attorney at the National Immigration Law Center, testified that lawmakers should proceed with caution on mandating an electronic verification system because of "E-Verify's database error rates, lack of worker protections, lack of due process, insufficient privacy protections and the significant amount of employer misuse of the program." Opponents also urged Congress to make sure that any compulsory federal E-Verify program contains a robust safe harbor for employers so that those who use the system in good faith will not be held liable by USCIS, or by the employer's workers, for system errors. USCIS official Soraya Correa, said that USCIS continues to improve E-Verify's accuracy by increasing the number of databases that the system checks, and expanding the use of the photographic-matching tool to include U.S. passport photos. USCIS is also working on an E-verify smartphone app, with the aim of providing an electronic and I-9 integrated version. With the passage of the Immigration Reform and Control Act, since November 6, 1986, all employers throughout the U.S., small or large, have been obliged to complete a form I-9 to record identity and work authorization documents for every new hire. The government has released six major editions of the I-9 form and on March 8, 2013 it released yet another version as well as a newly minted M-274, Handbook for Employers, Guidance for Completing Form I-9. The I-9 form has been reformatted and expanded and is now a two page form. The instructions are now five pages and the List of Acceptable Documents has changed slightly in format but not in content. The new form may be used as of its effective date of March 8, 2013, but employers have a grace period and may continue to use the older form (08/07/09Y edition) until May 7, 2013. There is no need to complete the new edition of the I-9 for current employees. Recording the social security number is optional, but employers who are registered with E-Verify must obtain the social security number in order to conduct the e-verification, which must be done within three days of hire. With the release of the new I-9, employers should take the opportunity to purge I-9s where the employee is no longer employed and the I-9 was retained for a minimum of three years, including one year after the employee termed. Canada's economy showed signs it may be ready to bust out of its half-year funk by churning out a surprisingly strong 50,700 new jobs in February, most of them full-time, in the private sector and in Ontario. The outsized gain was enough to keep the unemployment rate at the four year low of 7.0 per cent despite the fact over 60,000 Canadians joined the labour force in the month, another good signal for the economy. Regionally, Ontario was the biggest generator of new jobs, adding 35,300, followed by British Columbia with an increase of 19,800. Quebec had the biggest drop in employment, shedding 13,100 jobs. Finance Minister Jim Flaherty cited the "good economic news" Friday after his meeting with private sector economists, who gave him some bad news as well - the economy won't grow as fast as was expected this year. The February employment data showed all of the growth was in the services side, led by a 26,000 gain in the scientific and technical services sector. There were also 21,000 additional workers in the accommodation and food services, which may have been partly due to resumption of NHL hockey in late January. Public administration and agriculture also saw gains. Over the past decade the number of temporary foreign workers in Canada has tripled. The first ever national standard on personal data privacy protection has come into force in China. The guidelines, called the Information Security Technology - Guide for Personal Information Protection within Public and Commercial Information Systems (Guidelines), were originally proposed by the nation's telecoms regulator, the Ministry of Industry and Information Technology in 2011 and subsequently released by the Standardization Administration of China. The Guidelines provide guidance on protecting personal information handled in information systems and applies generally to the private sector. While the Guidelines do not have the force of law, the introduction of a general national standard on personal data privacy protection marks a significant move for China. The China Software Evaluation and Test Centre have announced it is forming a self-regulatory group to play a consultative role in future legislation in the personal data privacy arena. Organizations should take active measures now to prepare their data collection, handling and processing/use practices for compliance with the best practice Guidelines. Costa Rica now has its own laws on the storing, sharing, and access of personal information. Under Law #8968 individuals must now provide their express consent for the collection of their personal information in databases, and individuals will have the right to revoke that consent at any time. The guidelines include the "right to informational self-determination," which is defined as the right of every individual to know what personal information of theirs is collected in databases, and for what purpose. The only exceptions are in cases where there is a court order, or when a resolution is adopted by a special committee of the Legislative Assembly. Companies should start the process for Binding Corporate Rules (BCRs) now so they will be ready for the new EU data protection regime, stated Eduardo Ustaran, Partner at Field Fisher Waterhouse LLP. ''BCRs should be the next big project for companies," said Ustaran. 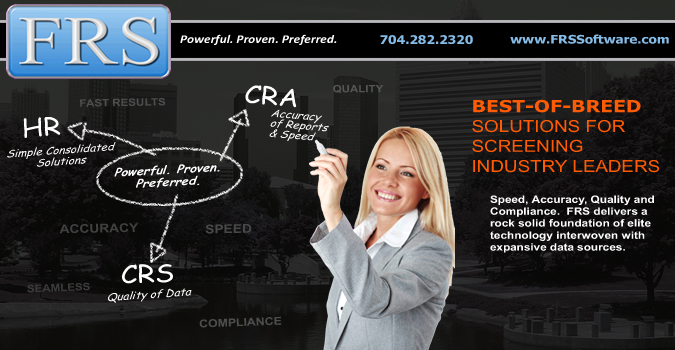 "The real success of BCRs is that they can be tailored to the way a company operates. BCRs are not just for multinationals; smaller companies can also benefit.'' In particular, the proposed EU Data Protection Regulation - put forward by the Commission in 2012 - recommends companies of all sizes adopt BCRs as a means of legitimizing intra-group transfers out of Europe, and states that they should be binding not only within companies but also with respect to third parties. Amendments submitted in January 2013 by EU Parliamentary Rapporteur Jan-Philipp Albrecht could add further obligations including data minimisation, limited retention periods and privacy by design. On the international front, the Asia Pacific Economic Cooperation (APEC) is currently examining ways to harmonise its Cross Border Privacy Rules to that of BCRs. The New York Times reports on the proposal to tax data collection with the goal of promoting sound practices for gathering and protecting information. French auditor Nicolas Colin, introduced the idea based on European countries' frustrations with their inability to collect tax revenue from Internet companies generating significant income each year, especially as budget deficits loom. "Every government needs revenues," Colin said, adding the individual taxpayer and small companies carry the burden if large corporations do not. Google and Facebook know that John Doe "likes" wine, is shopping for a Volkswagen and often e-mails Jane Doe. The new idea would require the companies to pay for gathering that information. While business plans built on mining consumers' personal information from the Internet are proliferating, so are concerns about the use of the data. Colin's tax plan would reward companies for providing their customers with useful information, while penalizing those that did not do so. Although the government commissioned the report, it is not an official policy document, and the finance ministry has yet to take a position on the idea. According to the latest Hudson report, Employment Trends Q1 2013, the majority of firms (51.3%) there intend to keep staffing levels steady and more than one-third of employers in Hong Kong (37%) plan to hire more staff in the first quarter of this year. However, Hudson's general manager in Hong Kong, Tony Pownall, says the local labour market has a shortage of highly-skilled workers. "Many Chinese companies see (Hong Kong) as a fertile talent ground, seeking to relocate people to offset their local talent shortages. Employment is rising in order to meet higher business demands and tightening job market capacity is continuing to push staffing costs upwards," Pownall said. Hiring sentiments in India's formal sector was +9% higher in February when compared to a year ago, with the pharma, IT and BPO sectors posting increased activities. The latest job index by local job board Naukri.com found that recruitment prospects are looking brighter than in 2012. However, sectors like banking, oil and gas, telecom and insurance saw dips in hiring levels, ranging between -9% and -13%. The auto sector posted flat hiring levels while capital goods (+9%), software services (+5%) and the pharma (+2%) sector all posted growth in hiring levels. In February, the highest demand was seen for professionals in HR, software services and accounts domains. Sales and engineering design professionals were also much sought after while demand for banking professionals unsurprisingly dropped during the month. Barring Hyderabad which saw stable hiring levels, hiring activity grew across major cities, particularly in Pune and Kolkata, Delhi, Mumbai, Bangalore and Chennai. The White Paper on Population was recently passed by Singapore's Parliament, but the response to it has been far from positive. Aside from the public outcry, the business community has also criticised it for being heavy-handed in its foreign labour restrictions. The biggest issue of contention has to do with the government's tighter controls on foreign labour. In a united move to oppose the paper, nine foreign chambers of commerce have written an open letter to Acting Minister Tan Chuan-Jin. "Our members are concerned with the revision of government policies pertaining to the employment of foreign workers in Singapore and the resultant impact on the operations of foreign and local companies and the overall economy," the letter, signed off by Australian Chamber of Commerce president Graham Lee, stated. It also warned that further tightening of labour would result in many organisations moving their operations overseas, and with that, many job opportunities for Singaporeans. Local firms are likewise feeling the pinch. Seah Kian Peng, MP for Marine Parade GRC and CEO of NTUC Fairprice, says his organisation is feeling the manpower crunch. Some 10% of its workers are foreigners. Can I Really Find Out if I'm Employing a Criminal? The Court of Appeal has ruled that the blanket disclosure of all criminal convictions and cautions may breach job applicants' human rights. In giving judgment, it said that, while the criminal records checks system and the disclosure obligations interfered with individuals' rights to privacy, the interference might be justified where the aim was a legitimate one, namely in order to protect employers and vulnerable people. However, the Court said that unfiltered disclosure of all convictions and cautions irrespective of their relevance was disproportionate to those aims and so breached the right to respect for private life. The Court did, however, say that the requirement to disclose serious offences was proportionate. This means that the Government may ultimately introduce a filtering system, which would take into account the relevance of information about an individual's criminal record to the job for which they are applying. However, the Government has applied for permission to appeal the judgment. On that basis, the Court has decided that its decision will not take effect in the meantime. The FCRA Basic Certification program series is now available for purchase.